If you’ve been trying to generate more leads for a while, I’m sure you’ve come across several platforms that claim to offer you “the best” solutions. Feature your best pieces of content. Then you’re told to be patient because they say that lasting results don’t happen overnight. You don’t have much time on your watch to wait for something that’s uncertain. Then you ask: Is there any other way? I know this may sound too good to be true but actually there is a way. 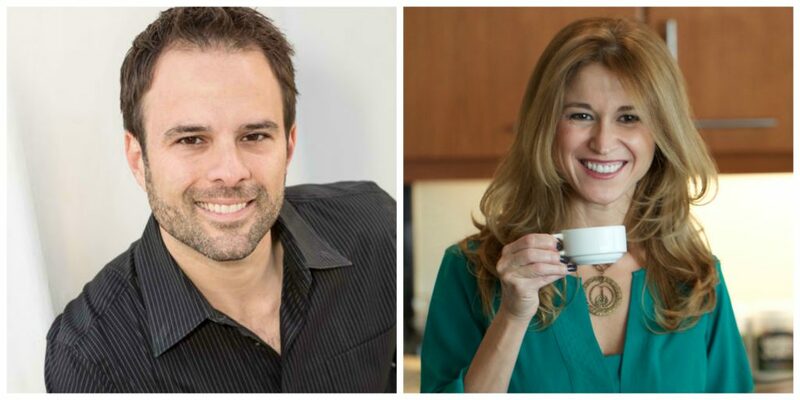 Discover the story of an entrepreneur who generated 3,000 leads in a matter of 2 weeks..
Brad Costanzo and his wife Kenia started a coffee brand called Stiletto Coffee. Stiletto Coffee was created for the purpose of empowering and inspiring women – career women, busy moms, or any woman ready to take on the world. Each cup of coffee would make women feel tall and strong – exactly how one feels when wearing a pair of classy stilettos. His challenge was to gain a distinctive position in the mind of target consumers considering the fact that 70% of people in the United States alone are coffee drinkers and already had their own favorite brands. He wanted to grow his leads so would be able to generate massive sales in the future. He leveraged UpViral’s viral marketing platform. How does this platform work and do wonders for any business and your business? 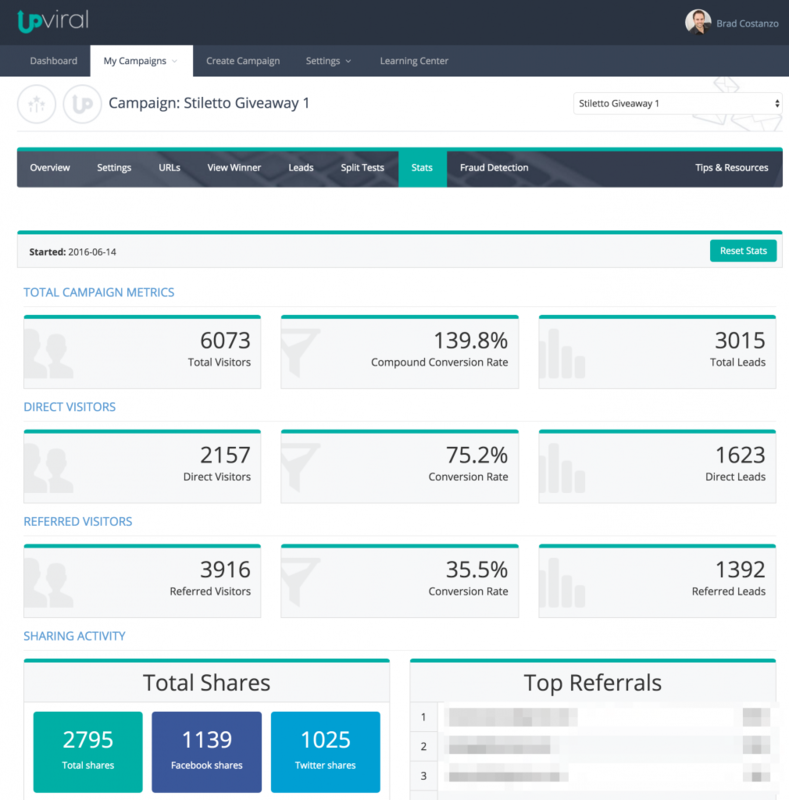 UpViral’s system is based on the concept of GOING VIRAL. When someone hears the phrase “going viral,” one may immediately associate it with cool, funny, intriguing videos and other forms of content on the web that gets thousands to millions of views within days. Kind of, but NOT REALLY! Going viral means having a solid system that guarantees that people will keep on talking about your brand and sharing it into the world. To motivate people to share your brand, you’ll be giving them an incentive, giveaway or bribe that they will find really valuable. Then the viral process never ever stops. This is what UpViral is all about. 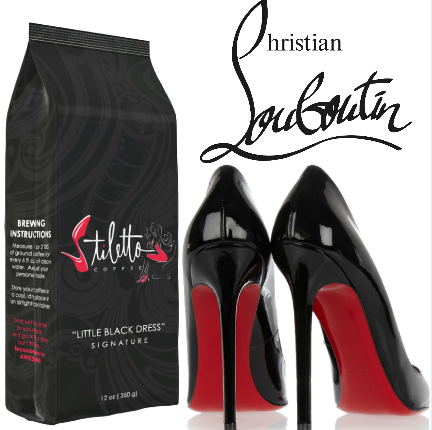 Brad chose to give out a pair of gorgeous Christian Louboutin “So Kate” heels (valued at $695) and a bag of coffee beans. He featured the pair of heels as the bigger prize for the reason that women would find it irresistible. There was no other luxury brand that could offer a pair of heels with red-lacquered soles. After deciding on the prize to get people to sign-up, Brad set up his lead page. 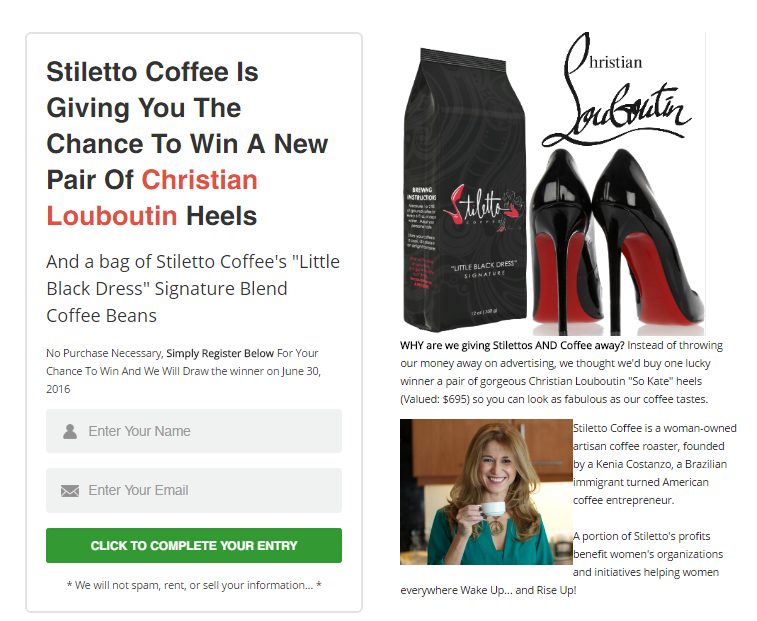 On the lead page, Brad explained the mechanics on how one can join the Stiletto Coffee contest as well as the reason for running the campaign and giving away the Louboutin heels + coffee prize. When they’d enter their email address, they’d immediately get 1 entry in the contest. 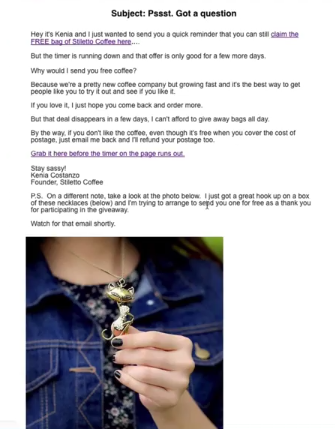 After people entered their names and email addresses, they were sent to a Thank You page (see screenshot below) where Stiletto Coffee gave out the instruction for people to share the campaign link to their friends and others on social media via social sharing buttons. For every social media site where they shared their link on, they’d get 5 additional entries to the contest. When any of their friends signed up through their link, they’d get another 5 additional entries to the contest, giving participants an incentive to keep on sharing the campaign with others. 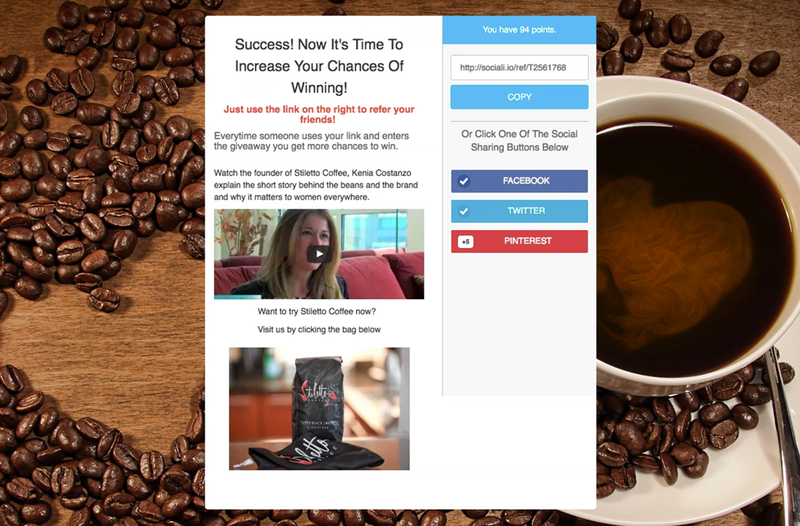 To allow people to know the story behind Stiletto Coffee, a compelling video of Kenia Costanzo was added to the page. 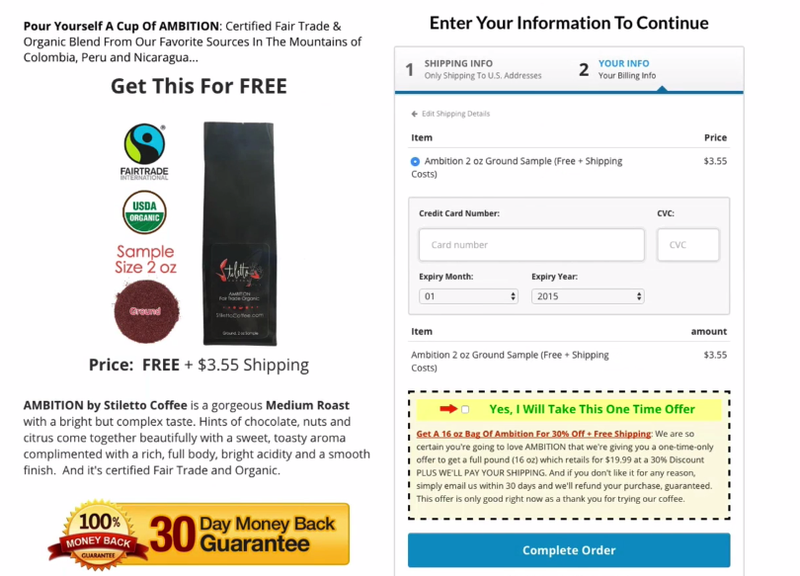 A link to Stiletto Coffee’s sales page was also included for people interested in buying the product. New people who were referred by the participants signed up for the giveaway contest and promoted it for more chances of getting the prize. Brad promoted the campaign on Facebook. He set up 2 different Facebook Lead Ads. For the first ad (which Brad named Loub leadgen), he spent $53.42 in the process. 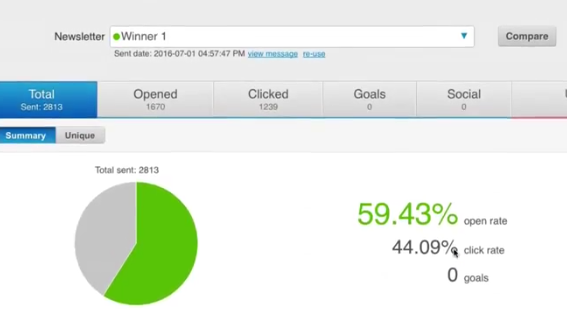 He integrated ConnectLeads which uploaded his leads immediately, in real-time, to his email autoresponder. For the second ad (Loub Lookalike), he used Facebook’s Lookalike Audiences, basing it on the leads he was getting with the first ad. He spent $108. Overall, the total ad spend was $161. Brad followed up with his leads by emailing them 2 weeks after the campaign. First, he sent out an email to announce the winner. While announcing the winner of the gorgeous Christian Louboutin “So Kate” heels + bag of coffee beans, Brad gave everyone the chance to still get a free 2 oz bag of their newest coffee, while only paying for shipment (a “free + shipment offer”). In addition to the free bag of Stiletto Coffee plus $3.55 shipping, Brad featured a one-time time offer in which they could get the same bag of coffee (16 oz this time) for 30% off. This order-bump ended up converting at 70-80%! Then another email was sent to further entice subscribers to participate in another “free + shipping offer” for a necklace (worth $19.99). 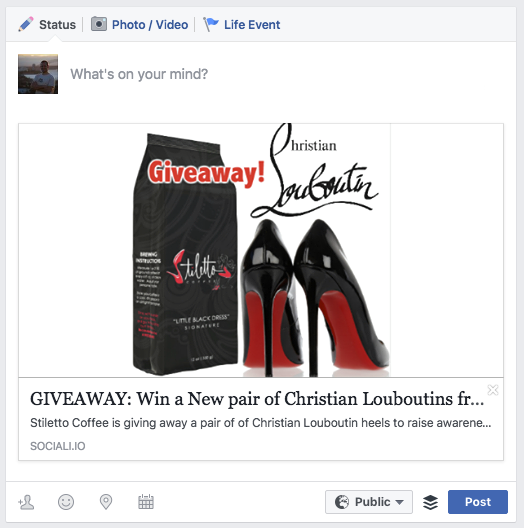 Brad Costanzo generated a massive 3,000 leads within 2 weeks of running the contest. On the Thank You page of the campaign, he generated $250 in sales from people who proceeded to the Stiletto Coffee sales page. The first email he sent for the purpose of announcing the winner had an open rate of 59% – pretty impressive considering that the email was sent 2 weeks after the campaign was launched. And best of all, he made more money in sales than what he spent on Facebook Ads, meaning he built a 3,000+ email list for free. Pretty neat, right? Was Brad’s UpViral Campaign A Success? It was his first UpViral campaign. Stiletto Coffee got massive brand exposure. Brad got 3,000 leads in 2 weeks which is impossible using other marketing methods. He still made money on top of the $250 he spent on Facebook ads. The overall experience was worth it! What Would Brad Do Differently Next Time? Instead of giving out a pair of heels, Brad would offer a giveaway prize that’s more coffee related – a mug or coffee maker. A relevant prize would have enticed people to buy the main product even more. For the Thank You page, Brad would probably put a discount and free plus shipping instead of just a link to the coffee product. Keep the ads running for a longer time. If Brad didn’t put off the ad after two weeks, he would have had more email sign-ups. 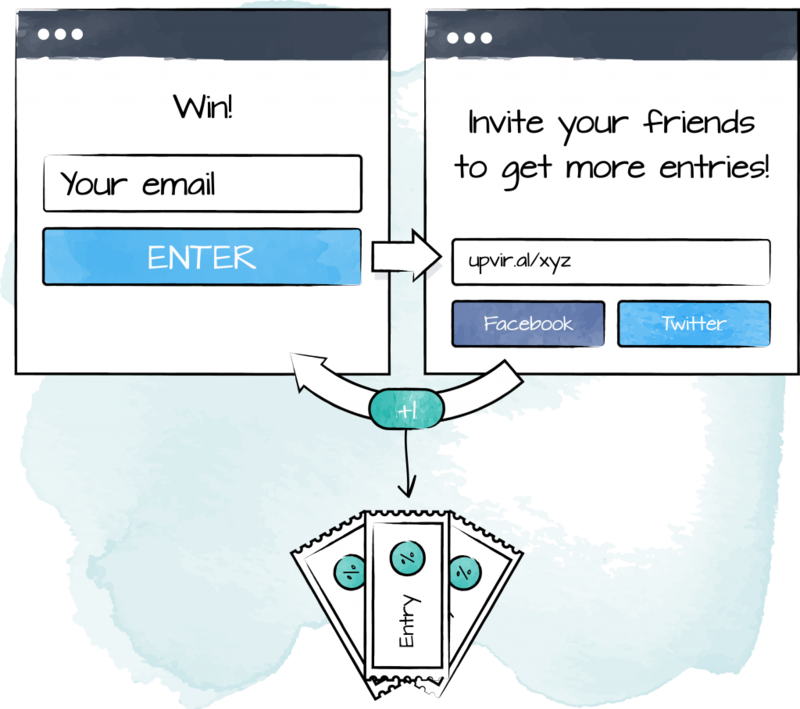 Increase the number of entries people get for referring their friends. Brad gave out 5 entries for every friend they referred, but would give out 20 additional entries next time. This imediately increased the perceived value, making sharing with friends even more of a no-brainer! By following these strategies, Brad intends make it to 30,000 and $30,000 in the future. When you get people to sign-up on your lead page and promote your brand in exchange for an incentive, and if more than one person actually does it, you get more and more leads in the process. You go viral. Rewards or incentives drive people to engage in whatever campaign you’re running – whether it’s for the purpose of generating sales, building brand awareness, growing leads, and more. 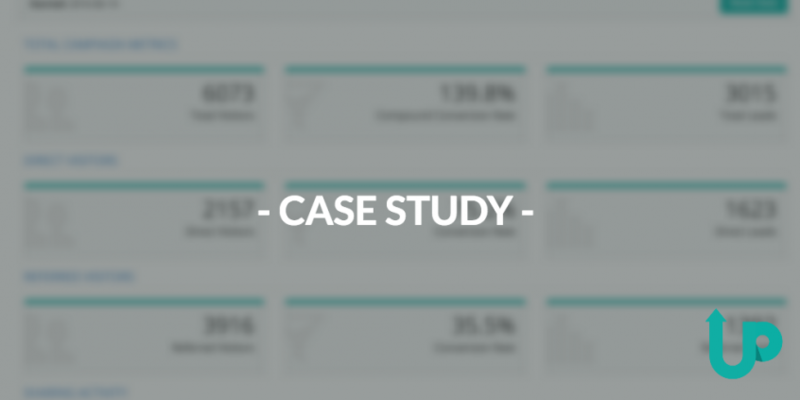 Brad Costanzo leveraged UpViral’s viral referral marketing platform and created a huge brand presence. How about you? Would you love to try UpViral yourself?